With the loss of trust of Startcom certs I found myself needing a new way to obtain free SSL certificates. Let’s Encrypt is perfect for this. Unfortunately SophosUTM does not support Let’s Encrypt. It became time to replace Sophos as my reverse proxy. Enter nginx. The majority of the information I used to get this up and running came from digitalocean with help from howtoforge. My solution involves CentOS7, nginx, and the let’s encrypt software. In my case I had a few paid SSL certificates I wanted to copy over from Sophos UTM to nginx. In order to do this I had to massage them a little bit as outlined here. Download p12 from Sophos, also download certificate authority file, then use openssl to convert the p12 to a key bundle nginx will take. Once you have your keyfiles you can copy them wherever you like and use them in your site-specific SSL configuration file. Uncomment the https settings block in /etc/nginx/nginx.conf to allow for HTTPS connections. Create SSL conf snippets in /etc/nginx/conf.d/ssl-<sitename>.conf. Make sure to include the proper location of your SSL certificate files as generated with the letsencrypt command. Solution found here: use the $host variable instead of the $server_name variable in your configuration. I couldn’t find any clear information about what to do about this on Sophos’ forums. My data disk was full. What to do? I can tell you what not to do – delete random files. I thought my solution would be to log into the UTM’s console and run a du -hsx /* to see where the space was. I found a large folder inside /var/storage – /var/storage/cores/httpd.16438. I removed it, because why not? and began reading the most recent logs. I could not find any useful fixes for this error. I kept digging. Finally, we’re getting somewhere! After some searching I learned that pg1 is the postgresql database Sophos uses. I found a way to rebuild from this forum post. This rebuilt the postgresql database that I apparently corrupted when I removed files with reckless abandon. My e-mails work again! I’ve been using a Sophos UTM virtual appliance as my main firewall / threat manager appliance for about two years now. I’ve had some strange issues with this solution off and on but for the most part it worked. The number of odd issues has begun to build, though. Recently it decided to randomly drop some connections even though logs showed no dropped packets. The partial connections spanned across various networks and devices. I never did figure out what was wrong. After two days of furiously investigating (including disconnecting all devices from the network), the problem went away completely on its own with no action on my part. It was maddening – enough to drive me to pfSense. As of version 2.2 pfSense can be fully virtualized in Xen, thanks to FreeBSD 10.1. This allowed me the option to migrate. Below are the initial steps I’ve taken to move to pfSense. Web Application Firewall, also known as a reverse proxy. Daily / weekly / monthly e-mail reports on bandwidth usage, CPU, most visited sites, etc. I haven’t migrated all of these function over to pfSense which is why this article is only Part 1. Here is what I have done so far. The wizard works fine for configuring PPPOE, however I experienced some very strange issues with internet speed. Downstream would be fine but upstream would be incredibly slow. Another symptom was NAT / port forwarding appearing not to work at all. It turns out the issue was pfSense’s virtualized status. There is a bug in the virtio driver that handles virtualized networking. You have to disable all hardware offloading on both the xenserver hypervisor and the pfSense VM to work around the bug. Details on how to do this can be found here. After that fix was implemented, speed and performance went back to normal. To get this working like it did in Sophos you have to disable the default DNS resolver service and enable the DNS forwarder service instead. Once DNS forwarder is enabled, check the box “register DHCP leases in DNS” so that DHCP hostnames come through to clients. Navigate to Status / system logs / settings tab and tick “Send log messages to remote syslog server” and fill out the appropriate settings. OpenVPN – wizard ran fine. Install OpenVPN Client Export utility package for easy exporting to clients. Once package is installed go to VPN / OpenVPN and you will see a new tab – Client Export. Note you will need to create a user and check the “create certificate” checkbox or add a user certificate to existing user by going to System / User manager, Editing the user and clicking the plus next to User Certificates. The export utility will only show users that have valid certificates attached to them. If no users have valid certificates the Client Export tab will be blank. It’s also very helpful to configure host and port aliases by going to Firewall / Aliases. This is roughly equivalent to creating Network and Host definitions in Sophos. When you write firewall rules you can simply use the alias instead of writing out hosts IPs and ports. I’m still working on moving the other services over. I’ve yet to find a viable alternative to the web application firewall but I haven’t given up yet. After a few very frustrating experiences I’ve decided I want to migrate away from Sophos UTM for my home firewall. I enjoy Sophos’ features but do not enjoy the sporadic issues it’s been giving me. My colleagues all rave about pfSense and how awesome it is so I thought I would give it a try. I have a completely virtualized setup using Citrix Xenserver 6.5 which has prevented me from trying pfSense in the past. The latest release, version 2.2.2, is based on FreeBSD 10.1, which includes native Xen device support. Now we’re talking. Installation was quick and painless. After some configuration, the basic internet connection function was working swimmingly. As soon as I tried to forward some ports from my WAN interface to hosts on my network, though, things did not go well at all. I began to doubt my ability to configure basic NAT. It looks simple enough – go to Firewall / NAT, specify the necessary source and destination IPs and Ports, and click apply. Firewall rules were added automatically. Except it didn’t work. I enabled logging on everything and there were no dropped packets to be found, but they were clearly being dropped. I thought it might be something weird with Sophos being upstream so I built my own private VM network but the issue was the same. NAT simply didn’t work. Silently dropped packets. I am not a fan of them. All of my packets sent to the WAN interface returned [Bad CheckSum] that I was only able to discover via packet capture – they weren’t in the logs anywhere. [root@xen ~]# xe vif-list vm-name-label="RT-OPN-01"
It worked! NAT worked as expected and a little bit of my sanity was restored. I can now make the switch to pfSense. HTTPS certificate handling in Sophos UTM is a bit different than other systems. I do this often enough but never remember exactly how to do it. Here are the “cliff notes” of getting an SSL certificate loaded into Sophos UTM. This can be done on any linux / unix system with openssl installed. The full guide was taken from here. When creating your key, make sure you use a passphrase. Sophos UTM uses Openssl so select that option if prompted by your certificate company Specify Apache CSR if asked. Validate your domain ownership, then wait for e-mail with response. Navigate to certificate management and specify upload key. Upload the file. Be sure to enter the password you used when creating the key earlier. The Sophos UTM firewall is a great piece of security software. It is designed with businesses in mind but is also free for home use. It has many features, two of which (User Portal and Web Application Firewall) compete for the same port – TCP 443 (https.) This is a shame if you want to run both services simultaneously but only have one IP address. For some reason the folks at Astaro (Sophos) have not engineered a way to allow the WAF and User Portal to play nicely, saying on their forums to just configure them to use different ports. What if you have people who are behind firewalls that only allow ports 80 and 443? You are stuck. I didn’t like that answer so I set out to research a way around this. The solution to this problem lies with Apache and its reverse proxy feature. A reverse proxy is a webserver that receives HTTP requests and forwards them to some other location, then returns the response. My solution to the “I want both WAF and User Portal to use the same port” problem is to put the user portal on a different, internal-only port, spin up a small apache server, configure it to forward all requests to the user portal address:port combination, and add it as a real server in the sophos WAF. Easy enough: Go to Management / User Portal / Advanced tab, scroll down to the “Network Settings” section and pick a different port, then click apply. I went with Ubuntu Server 14.04 so I could have newer software packages. Add your desired URL as a virtual server and point to your proxy real server (Virtual Webservers tab.) You’ll have to have an SSL certificate generated, which is beyond the scope of this post. The above configuration will work with every function of the User Portal.. except for the HTML5 VPN gateway. For some inexplicable reason it has scripts hard coded to use the root directory, which Apache won’t proxy properly even if you have rewrite rules in place. I fiddled with this for hours before I finally gave up and looked elsewhere for an HTML5 VPN solution. It’s more than just dip, it’s an excellent open source HTML5 RDP/VNC/SSH gateway. Unlinke Sophos’s option, guacamole properly handles being in a subdirectory. Unfortunately it is very frustrating and user un-friendly to configure. I decided just to use a pre-configured VM appliance from Green Reed Technology. It’s an excellent appliance and “just works” – a much better experience than wrestling with archaic configuration files. You can get it from here. Recently I have noticed some odd traffic coming to one of my blogs. This particular blog is set to NOT be indexed by search engines b(robots.txt deny.) Every bot that’s touched that site has honored that file… until now. Periodically I will get huge spikes of traffic (huge for my small site, anyway.) The culprit is always the same: Apple! Why are they crawling my site? I can’t find a definitive reason. A couple searches reveals articles like this one speculating that Apple is starting a search engine. The problem is the traffic I’m seeing from Apple shows just a safari user agent, nothing about being a bot. A discussion on Reddit talks about Apple crawling sites, but they also list a user agent I’m not seeing. The IPs rotate randomly from Apple’s IP space, with the biggest offender being 17.142.152.102. I e-mailed Apple at abuse@apple.com requesting they stop this action. I didn’t expect anything from it, and indeed nothing happened. I kept getting crawled. So, now to the title of this post. I had to tell my Web Application Firewall to block Apple’s address space. Sophos UTM 9.3 makes this easier, although the option is somewhat hidden for some reason. 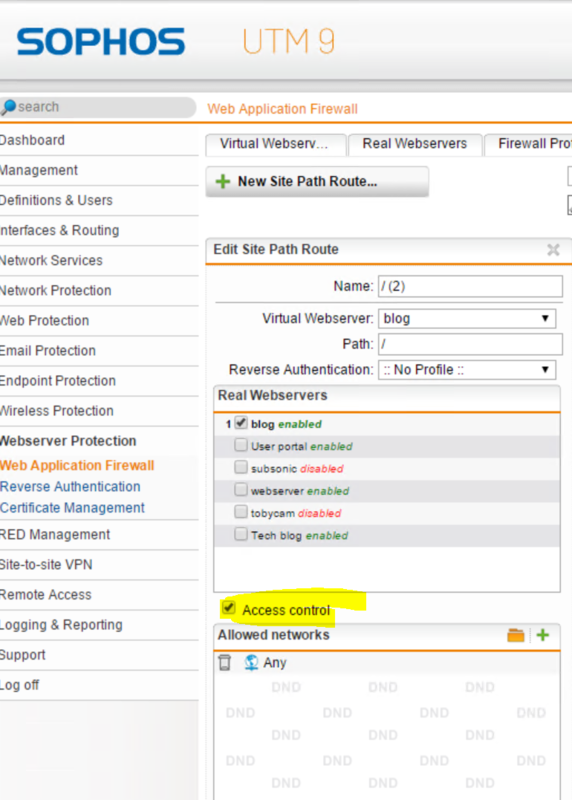 The option is in the “Site Path Routing” tab within the Web Application Firewall context. 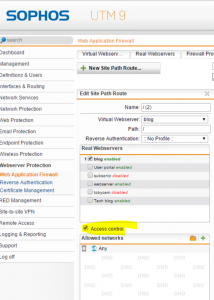 Once there, edit your site path and check the “Access Control” checkbox. In my case I decided to block the entire subnet – 17.0.0.0/8. No more Apple crawling.. at least from the 17 network. 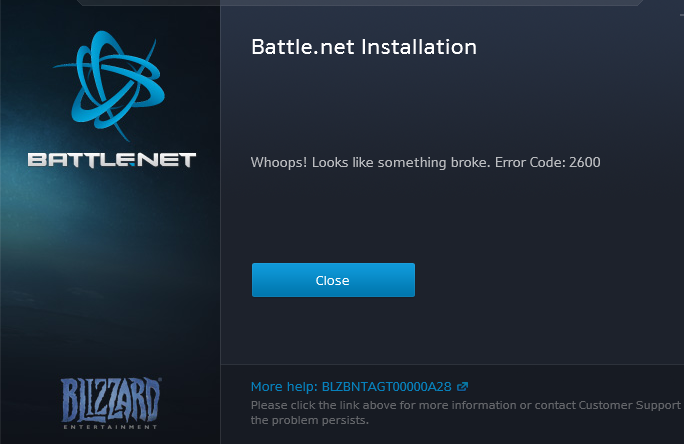 Recently I tried to install the latest patch for Heroes of the Storm when I got a nasty error code 2600, Whoops! something broke. 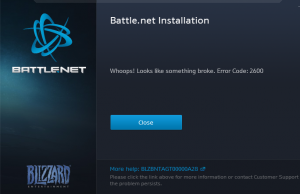 I did as it directed, which is to disable the caching function of my proxy and delete anything Blizzard-related from my %temp% folder. That did the trick. All is well now! This issue took me a while to figure out. It’s actually been an issue for a while but I didn’t notice it until XBMC became Kodi. XBMC moved their domain name to kodi.tv and suddenly I was unable to access their site at all. An nslookup returns NXDOMAIN immediately; however, querying a different server, say Google’s DNS, would return a valid address. After scratching my head for weeks I came across this post which outlines the exact same problem – any .tv domains are instantly not resolved. I didn’t notice it until XBMC moved to kodi.tv because I don’t visit .tv domains. The culprit: static DNS entries without a fully qualified domain name. I have plenty of these, and in this case, I have a computer named simply “tv” which Sophos translates into an internal DNS zone; Consequently it doesn’t even bother querying other DNS servers for anything ending in .tv. The fix: make sure you have fully qualified domain names for all of your static DNS entries. This best practice will save you headaches in the long run.